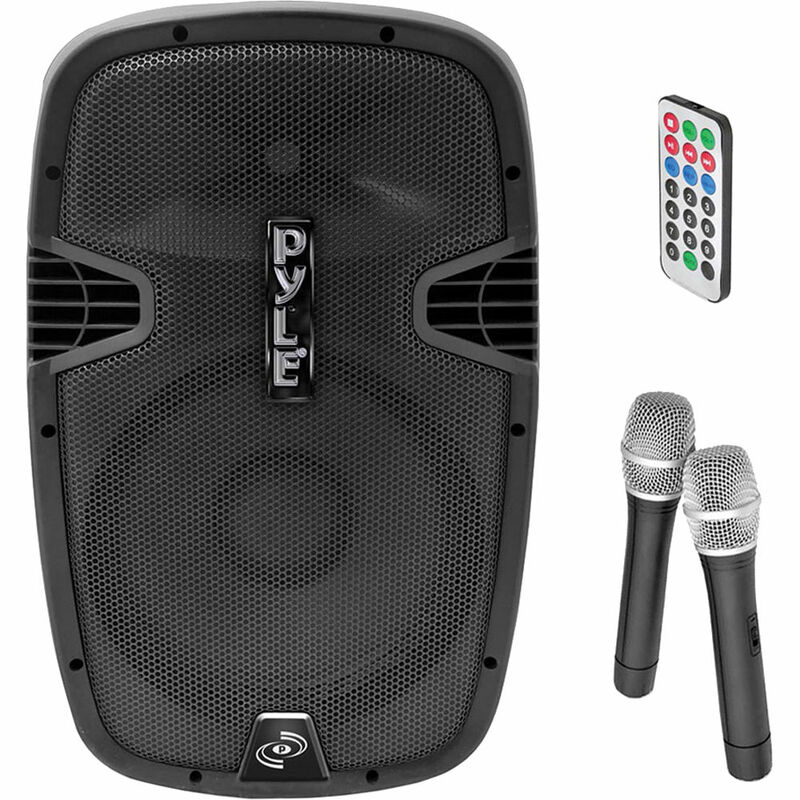 The PPHP129WMU 12" 1,000-Watt Bluetooth Streaming Portable Loudspeaker System from Pyle Pro is a 2-way portable loudspeaker capable of up to 1,000-watts peak, 500-watts RMS output. It features a variety of audio input options, including Bluetooth streaming audio, a built-in FM radio, both a USB and SD slot for digital input, and XLR and 1/4" inputs for mic or line sources. Additionally, it includes 2 handheld wireless microphones. Designed for portability, the PPHP129WMU features a built-in rechargeable battery that provides up to 4 hours of operation on a full charge. 2 detachable rolling wheels are included for simplified transport. Box Dimensions (LxWxH) 24.0 x 19.3 x 14.5"
PPHP129WMU 12" 1,000-Watt Bluetooth Streaming Portable Loudspeaker System with Dual Handheld Wireless Mics is rated 4.1 out of 5 by 25. Rated 5 out of 5 by alter from Better than expected I originally ordered a larger karaoke machine from Pyle with two 12 inch woofers but wasn't happy with it. I ordered this one and wasn't expecting much but it surpassed my expectations and has some pretty good bass and overall decent quality sound for a party, along with the built in battery and this is a very handy party speaker. Good for camping or tailgating where there is no power. Mic quality is good. The one glaring design flaw is the fact they had it default to the FM radio when turning it on...What the? That's a horrible idea and most of the time, causes it an extremely loud static noise when turning the unit on. They should've had it default to bluetooth or line in, that way when people forget to turn the volume knob all the way down when turning it off, it doesn't blast static into your ears the next time you try to use it. Rated 4 out of 5 by Anonymous from Good for 100 people outdoors with two speakers As others have said, the microphones are junk, but you can buy a pair of decent wireless mic's for < $100 and plug the receivers in to the inputs on this speaker. The sound quality is pretty good and the volume is quite good. I use to play music through bluetooth, and spoken announcements. Good for 100 people outdoors with two speakers. Can't beat the battery feature. Note I bought two of these, and using a RCA cord to connect the output of one to the input of the other, the second (slave) speaker is about 50% quieter than the first, so I always need to have the volume cranked all the way up on the slave. Handles and wheels are nice. This unit probably won't last forever but it's a good price. Rated 5 out of 5 by Anonymous from Perfect for small organizations Our organization meets every month and we have a few outreach events every year. We have needed something small but powerful enough to handle our in-room meetings and outdoor events. The wireless microphones work perfectly and the backgound music streaming through bluetooth is perfect for before and after the speakers. I have seen B&H at trade shows for years, but I have never bought from them. That changes now. Price was better than everyone else, and delivery was fast and painless. Rated 4 out of 5 by Anonymous from Very satisfied I was a DJ for 20 years. (Club, radio and mobile) I was in the market for something around the pool and outdoors for entertaining. I wanted great sound with the ability to use a mic and needed a battery powered system. I searched the Internet for a month and was looking in the $-$ range. I am very impressed with the sound. It cranks more than you will need when using the direct connect and a SIM card or flash drive. The Bluetooth is great but limits the volume. I was able to walk over 25 feet from the unit and still had a perfect connection but volume was average at best. I am pleased with my purchase and have no hesitation in recommending it. I gave it 4 stars and not 5 because I have not tested the limits of the battery charge as of yet. I have owned it for 3 weeks and with only one charge have used it several times but only an hour or so at a time. I'll follow up after using it for several hours straight and let you know how it goes. Otherwise for a portable sound system with many great features you won't be disappointed. Rated 5 out of 5 by El Cangriz from AMAZING DOSEN'T COVER HOW GREAT THIS IS! This Is The BEST Investment I Have Ever Made When It Comes To Electronics!... I Always Leave It In My Car In Case There Are Last Minute Get Togethers You Can Just Charge It Up The Night Before An Outing And Take It To Go!As A MC (Master of Ceremonies) I LOVE The 2 Included Wireless Microphones The Sound Quality Is Superb!I Have Taken It To The Lakes, Beach, Pool, Park, Backyards, Picnics, Birthdays & Even At Times Use It At Home As My Primary Sound System! (IT IS LOUD) Obviously Indoors Would Sound Louder Than Outdoors But STILL Whenever I Take It Out People Are Amazed At Everything It Does Making You The Coolest On The Block :) The Battery Life Lasts Me About 5-6 Hours With Bass & Volume All The Way Up, I Think It Actually Lasts Longer But Obviously The Sound Starts Degrading A Bit After 7 Hours Playing. The Bluetooth Feature Amazing Since I Dont Have To Get Up And Change The Song or Look For A Cable, And Friends Can Also Play Their Music From Their Devices Wirelessly. TRUST ME THIS IS A GREAT INVESTMENT! Rated 4 out of 5 by DJ Rick Gold from Very nice Speaker Sounded very nice right out of the box. But some items that came with it were damaged so I had to return it back. I needed the speaker for wedding ceremonies, so I will be purchasing another one. Thanks B&H for all your help! Rated 4 out of 5 by 3 Acentos from Good product. Not as loud as I expected Delivered just in time and perfect conditions. Its a little tricky to open the remote's battery slot. Every input works as described. Wireless mics work fine, bluetooth, mic inputs. Usb and sd readers work just fine. In my personal opinion, the speaker its not loud enough, I had to put all volume up to get a nice sound experience indoors. Overall it was a good choice for the price, portability and multiple input options. I would recommend this speakers for a small room with capacity for 30 to 50 people. Rated 5 out of 5 by Andrea D. from Initial Test - wow! We purchased 2 units for use on our tour wagons to give presentations while showing visitors our cattle, pastures, and woods. In our initial test we set the two speakers about 150' apart and I was able to walk approximately 400' away from them and was projecting clearly from both units. We were also able to steam music from a cell phone using the Bluetooth option. Can this be used with Keybord for a performance? sure it can... just use a make sure the 1/4 cable going into the jack on the back of the speaker is mono. Can you disable the bluetooth function? yes, you can. If you don't select on the mode option 'BLUETOOTH this will stay disabled. POWER FADES AFTER 15 -20 MINUTES . THIS SPEAKER IS PLAYING AN IPOD AND THE SPEAKER IS PLUGGED INTO A WALL PLUG. IF I WAIT 20 MINUTES I CAN USE IT AGAIN BUT FOR AN EVEN SHORTER TIME. WHAT'S WRONG? I'm stabbing in the dark here, but it sounds like a problem with the battery. Perhaps the battery is completely dead and needs to be charged some before using the electrical power source? Try leaving it plugged in with power off for a few hours before using it, especially if it's been a long time between uses. If that works, then try to remember to plug it in to a wall outlet the night before you're going to use it when it's occasional use. What is the max distance the talker can be away from the speaker? I walked at least 30 feet away around a restaurant and it still picked up well. I never tested it beyond that distance. Can I use a different wireless microphone with this system? CAN THIS BE USED WITH A DENON MIXER/CONTROLER....FOR DJ OR KARAOKE WORK? I don't know the answer to you question. We used it independently for a dinner. Also, FYI one of the microphones did not work when we received it, so I sent it back. And we had a corded microphone to a Aiwa boombox which we played music with. The corded Sony microphone was clearer than the cordless, but not significantly. But, for Karaoke, I think it would be good, because you have the option of walking with the microphone. The convenience of no cord was nice, I do wish the sound was clearer, but it was still very good. If I am using this to sing along with tracks. Do i need any receivers or anything to use the wireless microphones? hi there, well i think they are built in, but I HAVENT GOTTEN MINE BECAUSE UPS SCREWED UP, GAVE BH A CREDIT AND I HAVE YET TO RECIEVE IT!